The consumer has now become the dictator, forcing many big brands to change their ways. In its latest sustainability report, Unilever has revealed why its focus on this issue is proving good for business, writes Chris Arnold, founder of ethical marketing agency Creative Orchestra. It is a message that eco-ethical business people have been pushing up the levels to big brands for years. Many brands that have gained a valuable foothold in established markets, like Innocent, Pret, Lush, Ella's Kitchen, Method, have ethics at their core. These brands are also defined as ‘disruptive innovators’, so now everyone from CEOs to CSR executives are talking about disruption and how innovation can improve sustainability. Phrases like 'there’s no business as usual anymore," and "the old economic systems are no longer fit for purpose" may roll off the PR scriptwriters' pens but it’s essentially true. It’s not just technology that’s forcing change, but a massive change in values, especially among the valuable middle classes and Millennials. Despite the spin and cheesy text you get on many sustainability and CSR reports, underneath it all is a power for good. Most brands, even those who once paid lip service to environmentalism and respecting workers rights, now take these issue very seriously. But what has made a big difference is the realisation that being good is actually good for business – it’s not just a nice slogan. Being less wasteful saves money. Being more ethical resonates with consumers. Caring about everyone’s future assures yours. 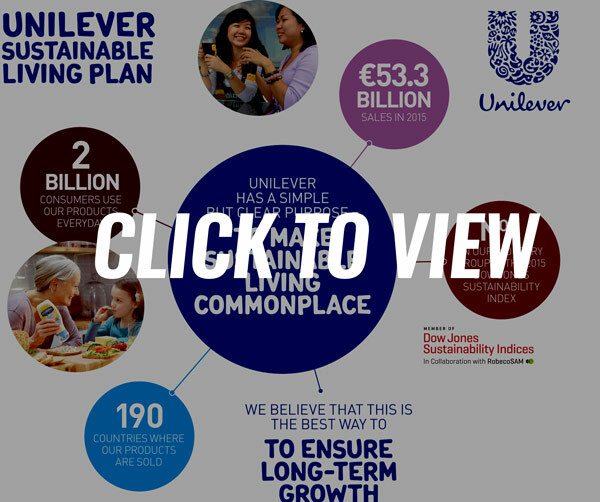 Unilever announced yesterday (16 May) that those brands that have adopted its Sustainable Living Plan have delivered almost 50% of their growth and grew 30% faster than the rest of the business. That’s impressive. There’s no doubt that most big brands have been forced to change their ways, through media, legislation and consumer pressure. It’s not that there aren’t people within these mega brands that don’t want to change, but CFOs answer to shareholders not consumers. But even shareholders now say "it’s not just WHAT you make but HOW you make it". Conscientious consumers are no longer a select few, they now outnumber those who don’t care, and are using the pound in their pocket not just to make a purchase but a point. And for a company like Unilever, the consumer now dictates the terms. But it should be noted that the term ‘sustainable’ isn’t a phrase that is consumer orientated, it’s the language of eco academics, consumers talk about Fairtrade, environmentalism, animal welfare, human rights and organics. Which is why is it is so complicated to win them over. Companies like Unilever have complex portfolios of brands, over 400, all with different sales propositions, talking to different consumers and all with very different ethics. Hellman’s may make a feature of animal welfare through it’s use of free-range eggs, even if putting mayonnaise on food adds calories. Dove thinks with a social purpose and champions self esteem, making beauty a source of confidence, not anxiety. Dirt is Good for Persil makes us feel good parents letting out kids play and get mucky, while encouraging us to wash at lower temperatures. Of course, if our kids didn’t get dirty we’d do 50% less washes. But behind the campaign is a social movement to encourage our kids to get out more, experience more and learn more. Lipton tea, with its 'Drink Positive' slogan supports the Rain Forest Alliance. Unilever's Sustainable Living Plan is well thought through and as ambitious as its desires are, "we can help change things on a global scale: deforestation and climate change; water, sanitation and hygiene; and sustainable agriculture and smallholder farmers, it says. When you are Unilever's size – in 190 countries and reaching 2 billion consumers a day - you can actually make a real difference. As the world's third-largest consumer goods company, the idea of merging sustainability with business growth – they want to double business - is almost Quaker in it’s simplicity and appeal. And let’s not forget the Quakers were the first architects of ethical businesses. One ambition, "to improve the health, hygiene and well-being of more than a billion people" would be laughable coming from a small ethical brand like Lush, for example (a brand I really admire) but given the scale of Unilever, is not unachievable. In fact, since the launch of the plan, it claims to have helped 482 million people. Unilever is not perfect and without its critics, but looking at the positive things I think they have taken sustainability seriously and are making a real global difference and that many other big brands should take a lesson from them.